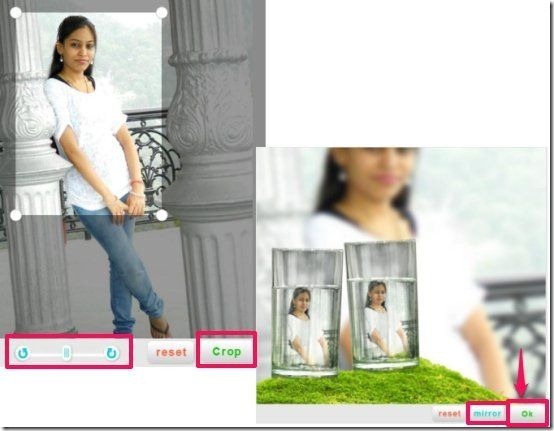 You can crop, rotate, or add mirror effect to photo. This photo editing website lets you adjust the the quality of the image. You can save the image to your PC in JPG format and lets you save animated GIF in GIF format. You can create stunning cool photos, cards, and animations using this online photo editing tool. The major flaw with this online photo editing website is that it adds watermark to your photos. However, the watermark is not so prominent, and is instead quite stylish and might look like an addition effect added to the photo. 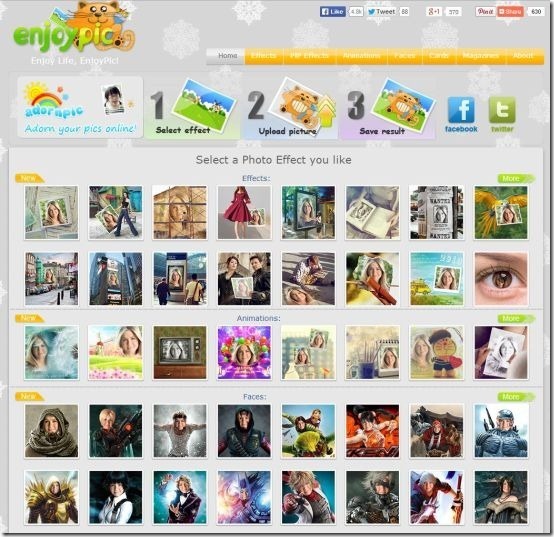 This online photo editor is quite similar to Cloudphotoeditor that I reviewed earlier. This online image editor does not have frames or glitter stamp, but it provides an interesting PIP effect (Picture in Picture Effect), which is quite rarely found amongst photo editors. How To Add Effects to Photos Online? 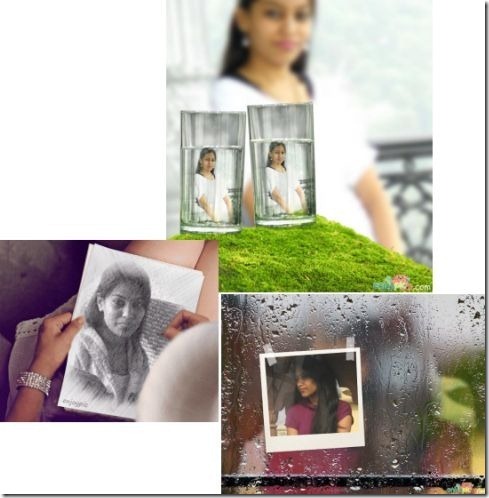 EnjoyPic is a fun online photo editing website. This can be accessed from the link provided at the end of this article. As soon as you click on the link below, it quickly redirects you to the homepage of EnjoyPic, where it provides you all the options, both on the top as well as on the entire interface. It provides you variety of effects, PIP effects, Animations, Faces, Cards, and Magazine covers, that you can use to recreate boring photos into attractive and impressive ones. Photo Effects: Create funny pictures by adding effects similar to PhotoFunia. PIP effects: Create attractive photo by applying Picture-in-Picture effect to your photos. Animations: Offers you variety of GIF animations. Face: Offers you many celebrity faces in which you can replace celebrity face with your face. Cards: Lets you make beautiful greeting cards. Magazine Covers: Lets you place your photo on Magazine cover and making you feel like a celebrity. All you have to do is simply choose the desired effects that you wish to apply. Here I chose PIP effect which is quite rarely found amongst photo editors. 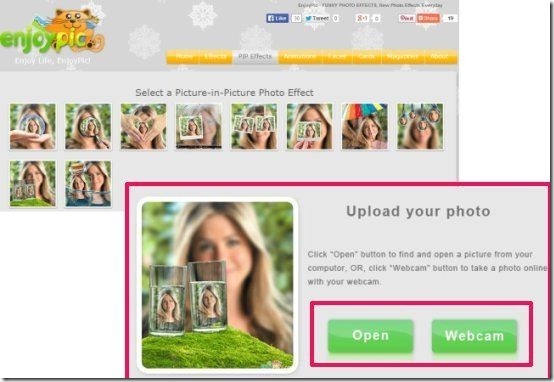 Then choose any photo from your computer or take a picture using your webcam. Soon after uploading one, you can rotate and crop your photo. Then you can use the mirror button, to flip the image. Once done, you can click on Ok button, to proceed to save the results. Before saving the photo to your PC, you can edit the file name and the quality of the photo, if required. It has the ability to save the photo in JPG, and animated GIF in GIF file formats. The final image saved to the PC adds a EnjoyPic watermark which is quite stylish, and in most of the cases it not much prominent.